Private Life, Chapter 6: Cyril Connolly says Starrett is nuts. A portion of Robert Bell's extensive review, published in The Observer, one of London’s oldest papers. This is one of several British clippings Starrett pasted into his personal scrapbook. The writing on the clipping is Starrett's. Starrett received a clipping of this brief news item from bookshop owner Cecil Hopkinson. I'm guessing Starrett purchased books from Mr. Hopkinson in the past. Starrett must have been quite pleased that even before his book was published, The Times ran two items promoting it. Here is an unsigned item announcing the book's anticipated publication. A second item appeared in The Times just three months later, on May 15, 1934, with the same headline. This time, Starrett's book was promoted as part of trend of books about Holmes on the British market. Ivor Nicholson & Watson's catalogue, with the page advertising the publication of The Private Life of Sherlock Holmes. From Starrett's scrapbook of newspaper and magazine clippings. 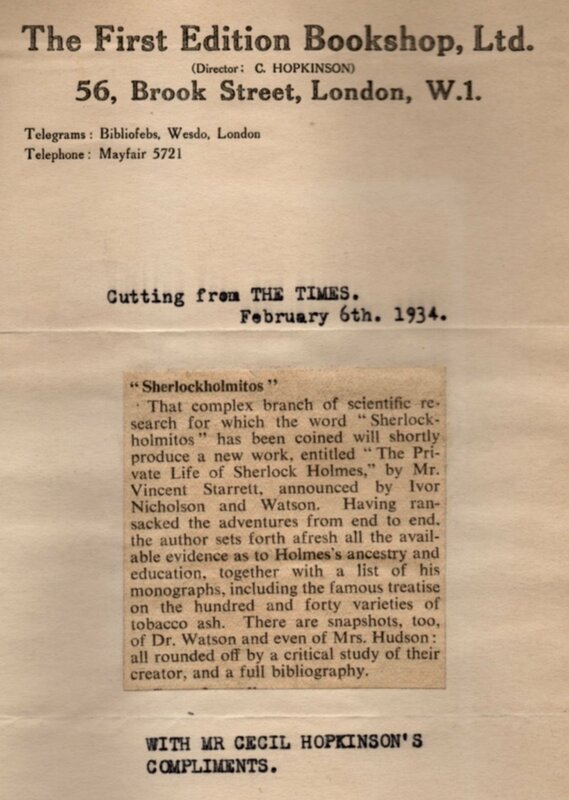 The full review from The Times of London, from Starrett's scrapbook. Private Life was published on June 10 and was reviewed in several publications, including all three Incarnations of The Times: The Times (daily), The Sunday Times and The Times Literary Supplement. Here are tidbits from each. He goes on to fault Starrett for not enumerating translations into foreign languages in his bibliography or giving more information on Dr. Joseph Bell. Bulloch felt Bell deserved a deeper biography, but he did grant Starrett a point for recognizing that Doyle was in fact, as much a model for his detective as was his old University of Edinburgh professor. The Times Literary Supplement was up next with its June 28, 1934 by D.L. Murray. It appeared under the headline “Sherlockismus," a term coined by Ronald Knox in his essay "Studies in the Literature of Sherlock Holmes." Last comes The Times with an unsigned review on June 29, 1934, whose author seemed surprised that an American has shed fresh light on the topic. "He could hardly have summed up the enchantment better." A portion of the Times Literary Supplement's Private Life review, pasted into Starrett's scrapbook. Notice how he edited the reference to Hornung in the second column. 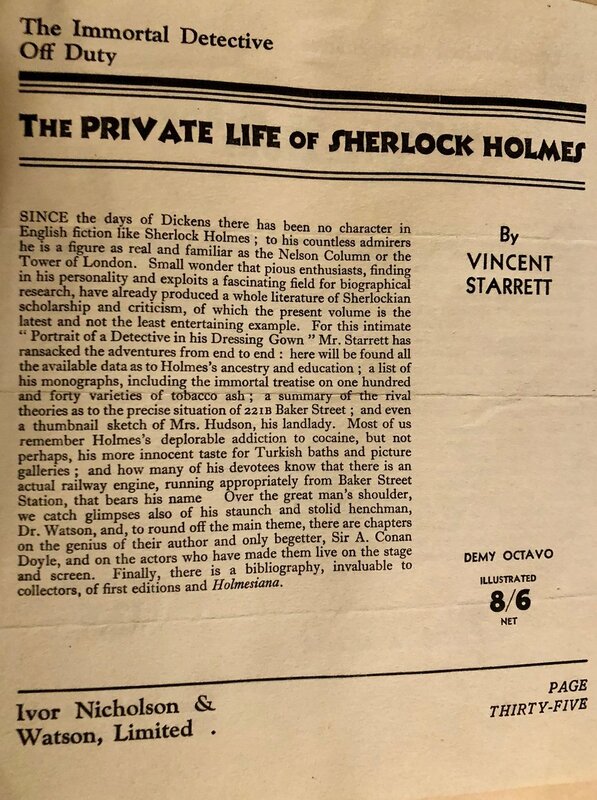 Robert Bell's review for The Observer on June 10, 1934, under the headline: “The Great Sherlock: A Myth Come to Life"
The improbably named Eustace Portugal, wrote a few graphs about Private Life for the July 1934 issue. Starrett’s insistence of using Robert Moriarty rather than James annoyed Portugal. A portion of Cyril Connolly's caustic review from The New Statesman and Nation of July 21, 1934. "Since the passage is taken from Mr. Vincent Starrett's The Private Life of Sherlock Holmes, the answer can only be what we fear it to be, and, as such, must give rise to a real anxiety about the author's condition. There are other passages in this book which suggest that it is fitter material for an analyst than a reviewer, but it may be possible to discover the more superficial processes at work behind this extraordinary cult." Connolly, who calls Sherlockian idolatry a drug, but not a dangerous one, is clearly bewildered by the joy some find in playing the game. "Why should the Holmes and Watson stories differ from these as much as heroin and morphia from bromide and aspirin, and reduce their addicts to the maudlin state of Mr. Starrett or the pedagogy of Father Knox? "This stampede back to the Watson womb is not as distressing as the effects on the intellect of the Holmes legend. It is a pity that Wilde and the Yellow Book aren't good enough for Mr. Starrett. … But, granted the nineties are chosen for an escape, a spiritual home, it is in detective stories, which must convey a great deal of information about people people in a very short space, that the circumstantial detail, the minutiae of living can be studied." Father Knox wrote "a perfectly legitimate piece of undergraduate brilliance" which then "became the occupation of grown men." He grumbles that "the commentators on Doctor Watson are chiefly those who have been in and out of colleges without actually belonging to them." I wonder if he knew Starrett left high school before graduating and never attended college? "Thus the Watson cult now combines an intellectual with an emotional escape. Back to Baker Street, where there are muffins for tea, a settled income for the middle class, no danger of getting run over, and Mother Watson, the goddess of Mediocrity, triumphant, of Not having to make up one's mind, there to welcome us." Connolly is not impressed with the work of his fellow Scotsman, Conan Doyle. "What is the place in literature of Conan Doyle's books when the homesickness and precious fooling they engender is set aside? As far as detective fiction is concerned, the stories are hopelessly out of date. They are not funny, nor probable, nor thrilling, nor intellectually honest. They contributed far less to the art that their predecessor The Moonstone, and to the great claim of the modern detective story, that it is the most perfectly constructed form of contemporary writing, they can make no pretence." "Mr. Starrett's book will not enhance their reputation. He is an amiable middlebrow, concerned not with the intricacies of textual criticism with the emotional fervours of a labour of love. He is a bibliophile and full of information on the 'untold tales of Dr. Watson' and the first editions of his hero." Connolly concludes by saying that Starrett only gives a glimpse of the "real story, the tragedy in the Jamesian sense—the struggle of Conan Doyle to kill of the character who was making him so much money in order to devote his time to 'serious' work." As painful as Connolly's review must have been, Starrett nonetheless pasted it into his scrapbook. Calling Starrett "an amiable middlebrow" must have felt like a good shot to Connolly, but I wonder if Starrett much cared. Starrett was largely an autodidact and never claimed to be an intellectual. Besides, most of the British reviewers jumped on the "Watson cult" bandwagon and encouraged their readers to do the same. For Starrett the bibliophile, his first major book to be published in Britain showed his idea was a success. Writing about Sherlock Holmes could be both popular and profitable. But like many books, it soon was to fade from the shelves. The Private Life of Sherlock Holmes was about to enter its own Great Hiatus. Next time: The Great Hiatus: 1934 to 1960.